The Zune will include in the box earphones, a protective sleeve, a USB sync cable and a sticker (oh boy!). I think they're right that people want to share music – unfortunately, people want to share DRM-free music so that they can do what they like with it. 3 listens is ludicrous. And 30GB seems a bit low, especially in light of Apple's recent upgrade. Come to think of it, there was a pair of stickers alongside my iPod. Funny, huh? Or, to be more precise, there was exactly the same gear in the box. Who said that <abbr title="Micro$oft">MS</abbr> didn't recycle Apple's ideas? If only they had come up with an iPhone, that would have been a wise move considering the strong push for it. But no, Steve didn't dare so they won't try either –too risky. Sounds very interesting. That built-in 802.11 networking would be a gem if it didn't have a time or play limit, and I really like the design! Yeah, I agree. 30 GB is definitely sufficient, but doesn't seem enough compared to Apple's new releases. I'm convinced there will be an iPhone; just give it a little more time. If you do, please let me know what you think about it. I wonder if it time-limits regular MP3's and other non-DRM content…? Still, looking at the bigger picture, it will be interesting to see what Microsoft is going to do. I'll be the last to say they won't succeed — Xbox is a good example of how they managed to find their own spot in the console market. I am positive Microsoft is capable of doing better than Apple. Apple is starting to slip and it's time for something new and innovative, because it sure isn't Apple. Whether that's WiFi sharing or not remains to be the question. They might not get it right in the first generation of the Zune, but they have everything they need to get it right later on. Oh, absolutely, it is definitely interesting and Microsoft have some enormous resources if they set their mind at succeeding. Zune had releaseg ,do you know how to Converter DVD to Zune and How to rip DVD and put DVD on Zune? Please visit below website there have some software can help you complete . Zune vs iPod Comparison here! dvd to Zune , you may converter any dvd to zune video. I've been looking into buying a zune for several weeks now. I'm a bit confused with people's reviews. On the first few sites I looked up reviews for the 30gb zune about 39% were negative, 50% were positive and 11% were neutral. Is the software really that bad? How much does it cost for one of the plans to buy music? How do I put music I already have on my computer onto the device? Should I buy an extended coverage plan? 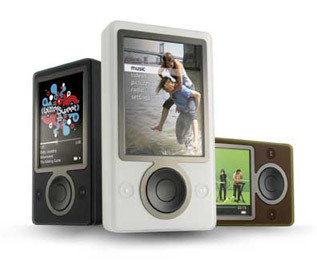 What's the average life of a zune? Can 'Limewire' be used to put music on this device? Please help! haha I'm so confused! I'm sorry, but I don't own a Zune, so I don't really feel in title to answer your questions. Please follow the links in comments above to find more information.